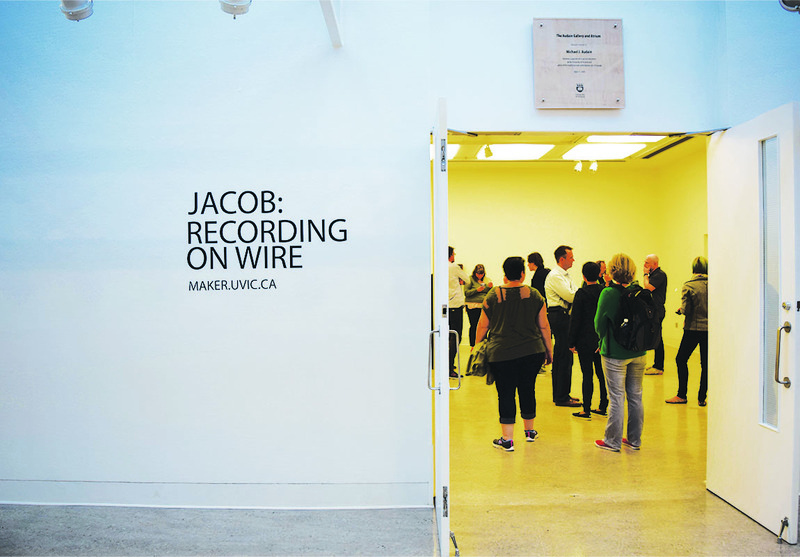 To test and share our research, we held our Jacob: Recording on Wire exhibit at the UVic’s Audain Gallery a few weeks ago. 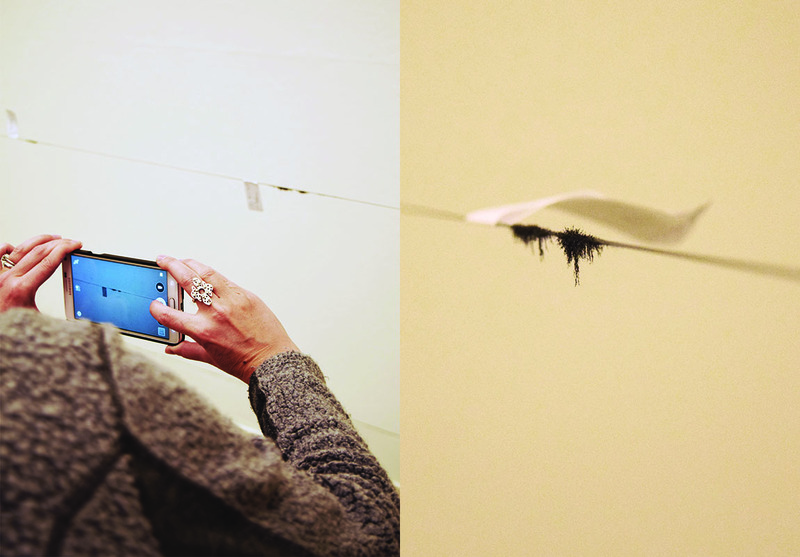 Throughout the week, we conducted a series of demonstrations in the gallery and encouraged participants to imitate the experiment by impressing their voices on the piano wire. 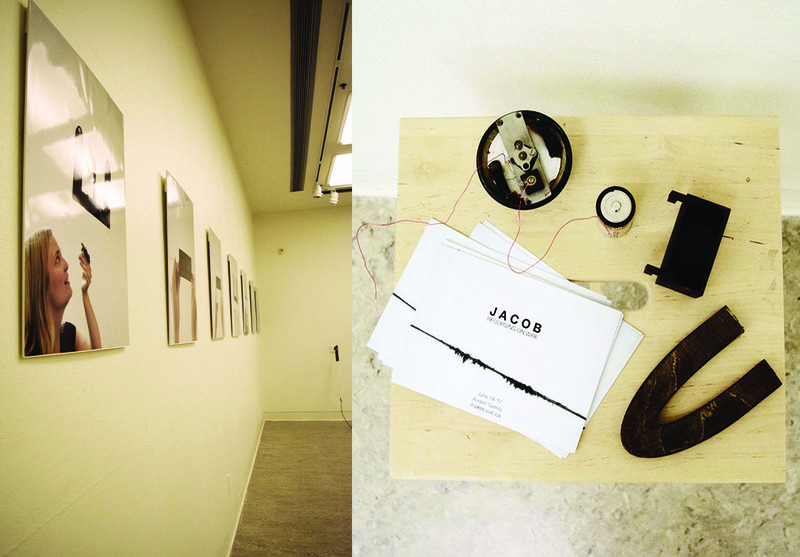 Because Poulsen used demanufactured telephone parts to record the name, “Jacob,” repeatedly on wire, we mounted a telephone box on the back wall of the gallery. The box was immediately visible when you entered the room. When visitors picked up the receiver, an audio guide provided historical details and context, with playback via a microcontroller, MP3 audio decoder chip, and amplifier hidden inside the box. 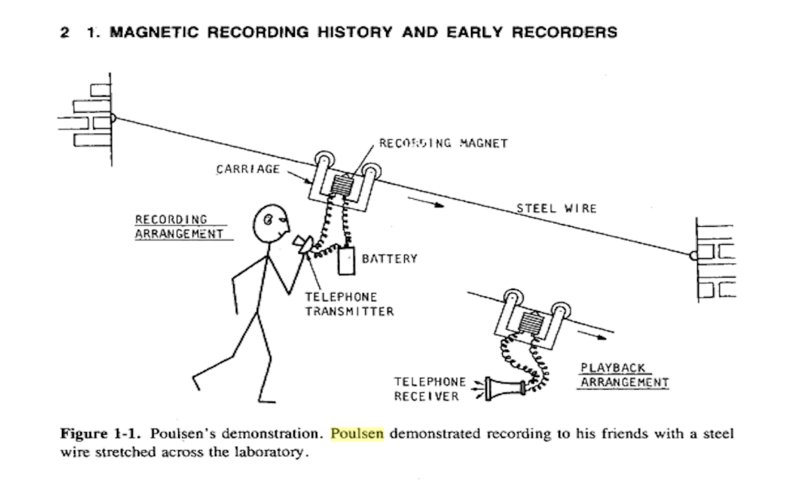 The wire strung diagonally on the left side of the room allowed participants to imitate Poulsen’s method of recording on piano wire. On the wall behind this wire, we hung a series of seven instructional photographs and provided participants with the parts they would need to imitate the experiment. 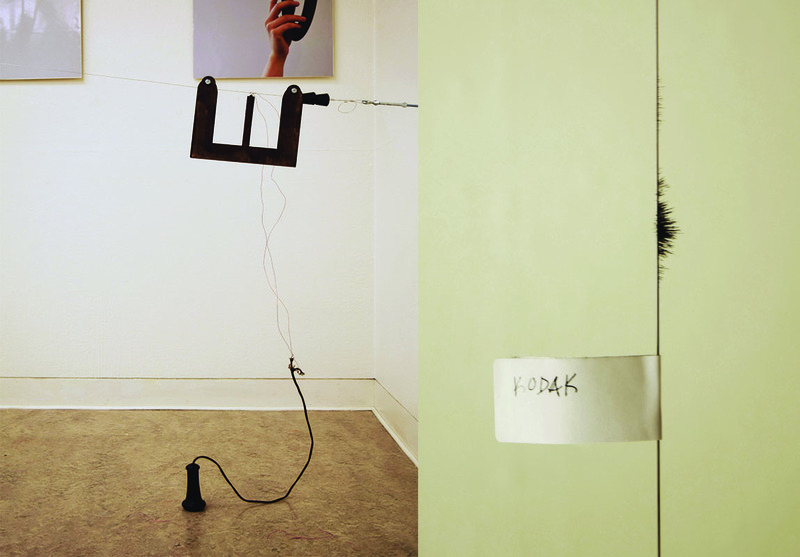 Participants were able to experiment with recording on the wire by hooking up provided telephone parts to the electromagnet, running alongside the trolley while speaking into the transmitter or listening to the receiver, testing their recording with iron filings, and wiping the wire clean with a permanent magnet. The wire on the right side of the room was strung parallel to the ground. 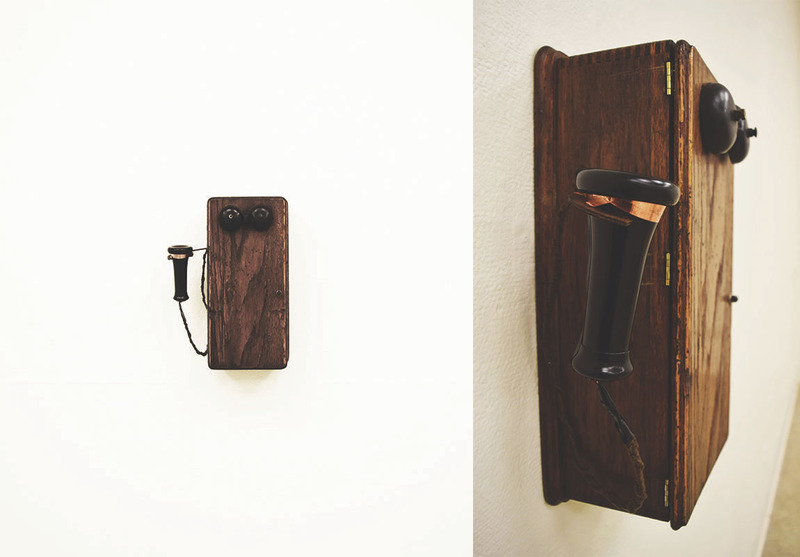 Throughout the week, a trolley progressively moved from one side of the room to the other as participants impressed and left their voice on the wire for the remainder of the exhibit. Beside each recording, an attached tag described the content stored on each section of the wire. Post by Danielle Morgan, attached to the KitsForCulture project, with the fabrication, physcomp, and exhibits tags. Images for this post care of Danielle Morgan and Marvin Camras. Post based on research by Katherine Goertz, Danielle Morgan, Victoria Murawski, and Jentery Sayers (including “Making the Perfect Record”), with contributions from Teddie Brock and Tiffany Chan.